Suburban communities offer better value for money, allowing tenants to save on their current lease. The updated Dubai Rental Index announced on Saturday will bring welcome relief to cash-strapped tenants. For those who may have been paying inflated rents, this is their chance to renegotiate with landlords and bring their rents down to the market average – or upgrade to a posher locality or larger units. There is also more supply coming to the market, which will further weigh on rents. In the ever-growing city of Dubai, the suburban effect is also currently underway. Tenants in search of bigger living spaces at affordable prices are moving away from established communities along the Sheikh Zayed Road corridor to those along the Mohammed Bin Zayed Road and Al Qudra Road. “Dubailand and Jumeirah Village Circle (JVC) and Triangle (JVT) are emerging as the most competitively priced rental districts. The substantial number of future deliveries in these areas are expected to sustain pressure on rental levels and continue attracting tenants. Closer to the date of Expo 2020, we expect areas around the Expo site such as Dubai South to also start seeing rental activity increase as projects currently under construction are handed over,” says David Godchaux, CEO of Core Savills, a real estate consultancy. Suburban communities offer better value for money, allowing tenants to save on their current lease or upgrade to a larger sized unit for the same rental value. Due to an increasing number of new buildings being handed over, Dubailand, Al Warqa, Dubai Silicon Oasis, Al Furjan and JVC have emerged as locations preferred by mid-income families. “Communities such as Mira, Mudon and Nshama offer affordable rates compared to their more established counterparts on Sheikh Zayed Road. For example, a rental comparison between two Emaar villa communities on opposite corridors – the Springs and Mira – reveals a 22 per cent discount for the latter which is located on MBZ Road. We expect there to be a greater movement towards the outskirts of Dubai as more suburban communities develop,” reckons Hussain Alladin, head of IR and research at Global Capital Partners. Other popular affordable communities for mid-income families are International City, Discovery Gardens, Al Nahda and Al Qusais. “There is a clear trend for more affordable two and three-bedroom apartments in the north and north-eastern side of Dubai, primarily on the border with Sharjah. This has made northern Dubai more attractive for Sharjah residents who work in Dubai, willing to shorten their daily commute times,” observes Cheryl McAdam, valuation manager, ValuStrat, a strategic advisory firm. Households with a monthly income of Dh15,000 are opting for two-beds in Al Nahda, Al Qusais, International City, Liwan and Al Warqa. Average rents for two-bedroom apartments here range from Dh60,000 to Dh70,000 per annum. 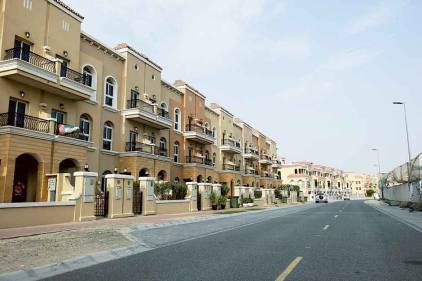 Households with monthly income of Dh22,500 to Dh27,500 can consider three-bedroom apartments for an annual rent of Dh90,000 in areas such as Al Nahda, Dubailand, Dubai Silicon Oasis, Al Qusais and Liwan. At the other end of the spectrum, those with substantial disposable incomes are still spending big bucks on their leases. “The top luxury rental areas in Dubai for families are Jumeirah Golf Estates [where average annual rent is Dh414,600], Palm Jumeirah [Dh517,500], The Lakes [Dh545,800], Polo Homes in Arabian Ranches [Dh715,000] and Emirates Hills [Dh1,270,000],” explains Ryan Kasper, luxury rentals director at LuxHabitat, a high-end property brokerage.